5-18-12 I think for this story to make sense , i must first tell you about myself. My name is Dave Hansen. I grew up in a place called Rapid City , South Dakota. My parents both grew up on a ranch or as farmers, like many people they migrated to the city for economic reasons. They were very good parents and tried to encourage myself and my two brothers to think for ourselves about what to do in life. My mothers parents homesteaded in the black hills in the early 1900’s, and this is where this photo was taken. At a small piece of land i got through my parents and grandparents. Their name was Pahkamaa. My grandmothers parents name was Juso, and they also homesteaded a little farther away in the late 1800’s. As i was growing up usually every week we would go to my grandmothers, she still lived on this land in the original log house. This is in one of the highest valleys in the black hills. I loved to go there and go hiking and follow the stream called Elk creek, in this valley there are dozens of springs. At that time it was still very remote, very few people ever went to some of these places. I remember i always got a certain feeling from being in the most far away places, i felt like i was part of nature and didn’t want to leave. I was probably only 7 or 8 years old, and more than once i got in trouble for making my parents worry and wait for me, but it seemed like once i started to go upstream it was hard for me to stop until i reached the very farthest springs. Then i liked to just stay there, i would feel something special there. By the time i would return to my grandmothers house it would be almost dark. I knew i was in trouble, but i couldn’t stop myself. Eventually my parents got used to this and didn’t worry so much. 5-19-12 As i grew up i was taught Christian beliefs, my parents were Lutheran. I remember i was very affected by these things i learned about Christ. Mostly how much he loved the poor people. But as i was learning these things i also began to have questions in my mind about the teachings. I remember asking the bible teacher once about if you don’t accept Christ you will go to hell. I asked him what about people in other country’s that have never heard of Christ. He said yes if they don’t accept Christ they will burn in hell. It just didn’t sound right to me. I know now maybe this was just his opinion , and all Christians may not believe this. But i think this was the beginning of my search for the truth about life and mans relationship with god. I was 9 or 10 years old i think. 5-27-12 During my younger years i continued to spend lots of time on this land, at a certain point my grandmother got too old to stay in such a remote place by herself. My uncles and aunts and my mother made the decision to divide the land into parcels and sell it so my grandmother would have some income, and she moved to the town called Deadwood where she lived until her death in the early 1970s. Of course if i had any choice it never would have been sold, but i was only about 11 or 12 when this happened. I guess it made some sense at the time to do this . My parents were able to get 2 parcels next to each other after this happened, they put an old air stream camper on one of them and it was a good place to go on weekends. When i was 12 i started to go hunting with my dad and my uncles on my mothers side. To me it was like a dream to go into the woods at the break of dawn and spend the day in nature. Later when i was 14 i got a drivers permit and i was able to go to this land with friends, or by myself sometimes. I found out that really i wanted to be at this place all the time. The feeling was so much different than being in the city. 6-1-12 As i got older i continued to be drawn more to nature, i wouldn’t say i was unintelligent , but i really seemed to lose interest in school. In my last 2 years of high school i felt more drawn to spending my time in the woods and in remote places. I dreamed about moving to northern British Columbia in Canada. I read books about this place and how wild it still was. I also spent a lot of time really thinking about god ,religion and the truth about life. In my last year of high school i went hunting almost every day from October to January. Needless to say this made graduating that year almost impossible. I talked to my parents about possibly quitting high school. They really weren’t happy about this, but finally they agreed that if i would get a GED. diploma they would accept my decision to quit. So i remember going to the testing place, and i took the test . I really didn’t study but i passed it easily. My parents suggested maybe i should join the military, and i gave it serious thoughts, but i just couldn’t see myself in such a structured life. I had very different ideas about what i wanted to do. 6-13-12 Somehow i found out one of our neighbors was in the logging business, so in the spring i got a job working for him. I was driving a tractor called a skidder,which pulls the trees out of the woods, and i was only 17 which was not really legal for me to do at the time. I would get up about 4am everyday and he would pick me up. We had to get to our work site by sunrise. I had never really wanted to be a logger , but i did want to be in the woods , so this was the best way i could think of to be in the place i wanted to be. I did really like it compared to the other jobs i might be able to get. After 4 or 5 months i was able to buy a pickup, and i had the option to cut trees since i had my own transportation. I bought a chainsaw and started doing this. It gave me even more freedom since i was being paid by the amount i would cut. It was about this time i started living in the camper on my parents land, I was getting closer to my goal to live there all the time. This was really my dream. It wasn’t too long after this my parents gave me the option to buy their extra parcel of land, i think they understood how much it meant to me , and although my brothers also liked it there, they never had a great interest to live there. Now i just had to find a way to build a house so i could live there. My grandparents were master log house builders so i started to learn how to build with logs. The Jusos and Pahkamaas had built dozens of log structures in the black hills, some were very well known. I decided i would cut down 50 good size trees and drag them to my land, i peeled them and stacked them, hoping somehow i would find a way to build even a small log house. I remember thinking at the time, maybe i could learn how to do these things here ,and then move to a really remote place in Canada. Of course I’m leaving out many details about my life out. I did have a few years about this time i drank alcohol, and even became involved with drugs. it was during this time i met a woman and we got married. This changed my plans alot , i thought i should be more practical and i took a job working for the railroad. This was at the time of the big boom in coal mining , and the railroad was really expanding. I started out working as a laborer, and eventually became a brakeman. It was a good job as far as the pay , but i really wasn’t happy because i wasn’t living where i really wanted to live. My marriage ended after a little over a year, it was a big disappointment. Something traumatic happened to me at that time. I continued to work for the railroad, but i transferred to Colorado. I would say this was kind of a low point in my life, for a period of time i don’t think i really cared if i lived or died. I continued using drugs and alcohol for another year or so until i had a few experiences that kind of woke me up. I looked at my life and asked myself what the hell was i doing? All during this time in the back of my mind was how can i live on that land? I kind of dedicated my work to saving enough so i could quit this job and move there with a little money. The one good thing about my job on the railroad is we had lots of time to read. We would sit in one place for long periods of time, and also sometimes stay in a hotel for a day or even two waiting to be called to work. I decided i would spend most of my time learning the things i wanted to learn about being self sufficient. I also had a great need to understand all the religions. I learned about Hindu, Moslem, and Buddhist, religions, along with many other less well known faiths. Also i was reading all the well known philosophers. These books seemed to lead me to other books. It was about this time i also read about native American beliefs, like Black Elk Speaks, and Lame Deer seeker of visions, and many others too. When i read them i was amazed how much i felt the same way about nature. I always knew there was a power in these remote places i loved, i could feel it when i was there. 6-16-12 As i read more about native American life and beliefs i started to understand just how close my own thinking and beliefs were to them. I had always wanted to live close to nature and i knew there was a power in the earth. I was also affected by the way i saw man living on earth. I felt anger and sadness at the way i saw nature disappearing , and cites and pollution taking over the world. I wanted to live on my land so much , but i still did not really have enough money to build a house there. I decided i would try to purchased a tipi and see if i could live in that while i find a way to build a log house. I had read about how living in a tipi brings you closer to nature. I was still in Colorado when i got my tipi. It was a really good one made for winter living , with a 9 foot liner , and a stovepipe hole so i could have a wood stove in the winter. I put it up at a friends house in Colorado and started to learn about living in it. Then in the spring of 1982 i took it to my land and set it up there. For about a year before this i started to really become interested in lakota thinking and religion, the way to pray with a pipe and the sacred ceremonies. I knew there was only so much you can learn from reading, but i did learn about respect for mother earth and all living things from these books. I wanted to live these things. I got a pipe and started to pray with it, I remember i prayed alot for mother earth that somehow people would begin to respect her and care for her more. I also prayed that the great spirit would take pity on me and help me. I built a inipi out of willows, i remember i did not really know how and the roof was very pointy , but i just prayed to the grandfathers to help me and guide me. i was very sincere i think, because it seemed to work. It seems like living in the tipi was having an affect on me, it started to change the way i felt. I could hear all the sounds around me , the creek i could hear day and night. I could hear the deer outside, and coyotes at night, and the wind and rain. At night when i slept, i could feel insects crawling on me, at first i would jump up alarmed, but eventually i got used to it. I just felt like i was part of the earth. I prayed everyday for help and to be guided in the right direction. I started to have very powerful dreams at night, of course i always had dreams, but these seemed different. Sometimes i would wake up in tears at the beauty of these dreams, but i wasn’t convinced it was anymore than a dream. Just a projection of my own thoughts and things i was thinking about everyday. 8-28-12 It was in the winter of 1982 i began to think about going on a hill and trying to fast and pray. I didn’t have anyone to help me or guide me. I just started praying every day that i could do this and the great spirit would help me. I started to just take walks and try to find a remote place that felt right. I finally chose a certain place that I thought would be good. I think it was late May i prepared by taking 4 sweats or inipis by myself over a week, Then i got up before daylight and went to this place with my pipe, I confess looking back i did not know the correct things as far as a traditional vision quest, but i was very sincere. I got to this place and started to pray mostly for guidance in my life and guidance in these spiritual ways. I was very unsure what to do with my life. And my closeness to nature made me think so much about the harm it seemed like humans were doing to the earth. I prayed over and over about these things. It was in the afternoon it started to rain pretty hard. I was soaking wet but i was determined to stay overnight. I remember holding on to a tree and crying and i continued to pray. It was sometime that night i felt like something inside of me said, I should not worry everything is going the way it’s supposed to go. I had to think about what that means, i had to give this long thought, but eventually i realized it meant the things happening on the earth are meant to be, and nothing is out of control. After this i just prayed to be some kind of helper for the Great Spirit. I knew i can’t really do anything except be like a tool. I promised to do what ever the Great Spirit told me to do. It seemed like after this powerful things started to happen. 9-3-12 I knew i needed help and guidance to learn these traditional ways. I prayed very hard that the creator would guide me somehow to find the right teachers. Later i met a man that was not much older than me , even though he was having his own problems at that time, he agreed to help me. Much of what he knew came from Kenneth Young Bear. Kenneth was a well known spiritual man from North Dakota that lived on the Cheyenne river reservation. He had a certain way of doing things , and i began to learn his way. I was told if i wanted to go Vision Quest i should start preparing by staying away from certain things like alcohol, or drugs. And i was to try to pray everyday for guidance. I knew now i would have to really dedicate my life to this. I still had my job on the railroad, but i was able to take quite alot of time off and live on my land in the Tipi. During the summer of 1982 i also began to build a very small log house, It was only 10 ft. by 12 ft.. i put in a foundation but wasn’t able to finish it that year. It seemed like my spiritual life was becoming the most important thing for me. And i really liked living in the Tipi now. Although i do remember the next winter being very hard. The snow was waste deep . We had a big snow in October and it stayed all winter. I was lucky i had spent time getting wood for the sweat lodge and for my tipi. I learned the tradition of making tobacco ties , and prayer flags for special prayers. I did this many times that winter and always i prayed for guidance in my life , and that i could be a helper for the creator, And that i would continue to be guided to the right teachers to help me. It was during this winter time i first met Stanley Looking Horse, He would become my most important teacher about these ways, and also became like a father to me. 9-10-12 Looking back now it was kind of like a dream living the way i did then. It was very difficult , but at the same time i really liked it. I remember living in the tipi when it was 20 below zero. i had the nine foot liner, and the wood stove. The snow was 3 or 4 feet deep around the tipi so it kind of helped insulate it, but you really had to keep a strong fire going. As soon as it started to die down it got cold quick. I was really having powerful dreams during that time, it was like the creator was really speaking to me. I was praying for guidance about what to do with my life and this place in the Black Hills. One night i woke up in tears, i felt like i had a special dream , and in that dream i was told i should use my land to start a learning center. A place where people could learn things that are being forgotten. I had a very different feeling when i had that dream, it was different than a normal dream. It affected me deeply in a way that’s hard to explain with words. I was learning to recognize this feeling, but i also had doubts that it was really the creator speaking to me. Even though i felt it was very different from a normal dream. Maybe it was something that just came from my own mind. I asked the creator to please help me , maybe give me some kind of sign that would help me to know it was not just in my own mind. I think i was praying for some kind of miracle that would help me have strong faith. 9-12-12 It’s hard to explain what it was really like living that way, in a tipi alone in a very harsh climate. In some ways i remember it being very beautiful going out at night and seeing the stars and the snow sparkling like diamonds. But it was also very difficult and lonely. I think it just made me very humble. I wasn’t afraid to cry when i prayed, and i think i cried alot. I kind of felt inside how pitiful i was, so weak in so many ways. But these dreams i was having kept me going. I was having so many dreams about flying , and they seemed so real. I could control where i went and i remember flying over the far ridge to places i wanted to see. When i woke up after one of these dreams i would be very tired like i never really slept. I remember one time i think i had flying dreams for over a week every night, I was exhausted. I felt like i wanted to tie myself down somehow so i could get some rest. I kept thinking about the dream that told me to start a learning center, it seemed like the most powerful dream i ever had. I thought that i understood it. In my life i had been trying to learn things that are being forgotten. Like how to tan deer skins, and how to build using logs, also preserving food and canning. As i said before i had ideas for a long time that i wanted to live in these remote places, and learning these things is just part of survival if you want try to live without much money. But it also seemed like there was more to it than just a survival school, i just wasn’t sure what yet. But i started to pray about this dream , that i could understand what i was supposed to do, and also that i would meet the right people that could help me. I had that dream in March of 1983. Maybe about a month after that i had a special inipi ceremony , i made prayer flags and really prayed for understanding about this dream. Also i asked that the right people would be guided to me to help me. It was a few days after this special prayer i met a group of women that came to Pine Ridge to open a women’s clinic. There was something special about them it seemed like to me. I decided to tell them about the dream i had just to see what they say or think. I told them my story and they listened. One of the women was named Jahanara Romney, her husbands name is Hugh Romney, Also known as Wavy Gravy. They actually had been some of the founders of a commune in California called the Hog Farm. I really hadn’t thought about how they might help me. I was really just going on a feeling i had, I prayed for help and teachers and i thought they might be sent to help me somehow. Jahanara said she would think about what i told them, and talk to Wavy, and maybe she would write to me later. A couple of weeks later i received a letter from Jahanara, telling me she had talked to Wavy, and he invited me to come help with a new camp they were making on their property near Latonville California. It was a camp mainly for kids called Camp Winnarainbow. It was going to start in July, and they said they could use some help putting up Tipis, and lots of other things that needed to be done. 10-28-12 As it got closer to spring, i spent weeks walking in the hills to try to find the right place to Hanbleceya, (or vision quest). I even drove to some other even more remote areas, to see if i could find the right place. To me it didn’t matter if i had to build another inipi, i just wanted to find the place that felt right. Finally after much searching i found the place about a mile and a half from my land. It was very remote and it felt good there. I started to go there every chance i had to pray or just sit there and become part of that place. As i said before i survived a difficult winter living in the tipi, i felt very humble and pitiful by this time. I decided i would wait until the chokecherrys bloom. According to Kenneths teachings this was the most powerful time to Hanbleceya, because it was the time the animals were being born. It varies when the chokecherrys bloom. On the prairie they can bloom in early or mid May. But at this high elevation they don’t bloom until late May. Kenneth also had something called a medicine way, I’m really not sure if it came from his own vision or was passed down to him. It required i get 6 red quilled medicine wheels, one would be attached to each chokecherry tree where i would sit, and one would be attached to my pipe, and one would be attached to an offering pipe i would make. Also on my pipe above the medicine wheel i would attach a pink shell, and then a small buckskin pouch with little bits of everything from the earth. A tiny bit of plants ,animals, insects, etc. This was his own special medicine way. As the time to hanblecheya got close i prayed more and more for guidance. I was praying everyday, I was very anxious for the day to come. During this time i had put the things i would take on the hill with me in the inipi to purify them . The tradition is to purify these things in the inipi four times before i used them. I should say now im not telling all the teachings i learned, but some of these things are important to this story . I was very blessed to have such good teachers that taught me these sacred ways. I learned how important it was to do even the small things in a good way. Making sure everything i used was clean and there was enough sage in the inipi, and many other small things. Also because we are all human and make mistakes, i always prayed that anything i did wrong would be overlooked. Finally the day came, it was actually early June, the chokecherrys had bloomed. Kenneth had a tradition that was different than many teachers, His way was to have the dinner and giveaway before the hanbleceya. A friend of mine from Colorado was very interested in what i was doing and came for the ceremony that day. He didn’t know much about these ways but had been to a couple of the sweat lodge ceremonies and wanted to help. I started the fire in the morning for the inipi, i used a certain amount of rocks. These were special rocks i had gotten in Wyoming, they are very heavy black rocks that get very hot and hold the heat a long time. We worked hard to make the fire very strong adding split wood over and over. This would be the last time i would purify my medicine wheels and some other things before the hanblecheya the next day. I remember i became very emotional crying at times. I had waited a long time for this day. I prayed over and over to the creator to please help me and take pity on me. I’m a weak pitiful man. After several hours the rocks were white hot, it was time to fill the pipe and begin. We smudged the things we were using with sweet grass and cedar. There were just three of us there. The man helping me and my friend from Colorado and myself. After we sang the pipe songs i put the six red medicine wheels in the inipi frame over where the rocks go. I would be the one to bring in the rocks. After my friend and helper were inside, we place the first six rocks in the proper places smudging each one, and praying over them. Then i started bringing in the rest of the very hot rocks, These rocks were so hot they were scorching their skin, so they had to lay down a little. As i continued bringing in the rocks , i started to smell something like hair burning. I looked inside and saw the red quilled medicine wheels were burning up in the rocks. I quickly tried to get them out, but i only got two, and the other four burnt up. My first thought was now i don’t have what i need for my hanblecheya. There was really nothing i could do so i just accepted it. We went on with the inipi ceremony. 11-4-12 After the Inipi ceremony was over, we went on to have a dinner and my giveaway, I should say that if it was up to me i would probably just do these things without telling anyone. But i was told that i should do this the traditional way. And that meant having a dinner and giveaway. There weren’t very many people there just a few very close friends, and my parents. Maybe 9 or 10 people, i really was pretty poor and did not have that many possessions. I wanted to be sincere and ask the creator to take pity on me and help me. So i gave away most of the things i owned. it felt good to be free of these things in some way. Now i felt like i was ready. After every thing was over my friend from Colorado was taking some photos. He had recently gotten a fairly good camera. I personally took very few photos during this time in my life. After he finished taking photos he told me to take his camera and take some. So after he showed me how i went on the hill and took a photo of the sun setting, and a few other pictures. My friend was going to leave the next morning to go back to Colorado. I would be going on the hill the next evening. 12-1-12 Finally the day had come for my vision quest, i spent the day getting ready, and trying to prepare my mind for what would come. I knew it would be difficult, but i was ready to offer my suffering to bring me closer to god. I finished making the tobacco ties that would go around the place where i would sit. These little cloth pouches each with a pinch of tobacco and a prayer would protect me in the place where i would pray. Once i finished them i took the four chokecherry trees and a large amount of sage i had gotten to the hill i had chosen. I remember i had to make two trips to get everything there. it was about a 3 mile walk up and back. I took a stake and hammer and made holes to put the chokecherry trees in. They were spaced about 7 feet apart in each of the four directions. I put the sage inside this square and made a short prayer that this place would be a sacred place and for the great spirit to take pity on me and give me whatever i needed here. I returned back to my land and started the inipi fire. Now i had to prepare my prayer flags that would be tied to the choke cherry trees. This took quite a long time, as i prayed to each direction with a pinch of tobacco, finally my flags were ready. The last thing i had to do was attach the remaining 2 medicine wheels to my pipe and offering pipe. This also took time first i made a small buckskin pouches, and started to gather small bits of all living things from the earth. Just tiny pinches of plant, animal ,earth, bird, to represent all living things. I made very sincere prayers as i gathered these things that they would take pity on me and let me become a helper for our mother earth, and all living things. Then i tied the piece of buckskin shut with some deer sinew. i took the pouch and also a pink shell and the quilled red medicine wheel and attached it to the stem of my pipe. First the red medicine wheel, and next the pink shell, then the buckskin offering pouch. All joined together i tied them to the stem using more deer sinew. I prayed over and over to Tunkashila, please take pity on me. I’m trying to do these things in a good way. 12-15-12 Now the time had come, the rocks were very hot, My helper and I both sang the pipe songs and filled our pipes with canshasha the sacred red willow tobacco. I think at this time it was just such a relief that this time was finally here. I had prayed and thought about it for so long. I was ready to accept whatever came. After the inipi ceremony i took my pipe and a buffalo robe i had gotten and started the walk up to the hill i had chosen, I remember crying on the way asking the creator to please take pity on me and give me whatever i need there. We arrived at the alter i had prepared and tied the prayer flags on the 4 chokecherry trees, then we took the tobacco ties and went around the outside of the chokecherry trees making the sacred circle i would stay inside of. I entered this circle and prayed to each direction and to the sky and earth. then the circle was closed. My helper sang a special hanblecheya song and left. Now i was alone. I felt like there was electricity in the air. Maybe it was just me, i had been praying since early in the morning while i prepared these things. Now it was dark and i just kept praying over and over to take pity on me . I was only a weak man i had made many mistakes in my life, i asked that the creator please take pity on me and use me as a helper for our mother earth. I know im not worthy to be a helper to our creator so please help me somehow. I was crying so much, i prayed like this over and over through the night. Just as dawn was starting suddenly i saw something, it was a door, a very large powerful door. It was reddish orange a kind of pink, like a sunrise only a thousand times brighter and more beautiful. This door was shiny like a shell, and the top had an angle kind of like a coffin. It was small at the top then it angled out then it went straight down on the sides. It was so beautiful , i knew what it was . It was the door to the spirit world. As i looked at it i felt it changing me. Then a very simple but powerful voice inside of me said. AS LONG AS YOU’RE OUTSIDE YOU MIGHT AS WELL COME ON IN. And the door opened. 12-18-12 Now I’m going to stop the story . I need to say something at this time, it’s very hard for me to tell this story. For almost 30 years I’ve only spoken of these things to a very few friends. There is a traditional belief here that one does not talk about their vision if they receive one. But as i said earlier i had a dream in 2008 that told me to use the miracle i was given, so now I believe I must do this. 12-20-12 And a voice said AS LONG AS YOU’RE OUTSIDE ,YOU MIGHT AS WELL COME ON IN, and the door opened. I’m not going to say what i saw inside the door, but it happened fast and then it was gone. It seemed like such a strange thing for this voice to say, It made me feel like laughing. It seemed like the voice was saying, Your not important but as long as you’re here you can come inside. The words were so simple but direct, the way a humble person would invite a beggar into their home. This whole thing happened in a very short time, but i knew somehow my life changed forever. I know you might think this was not that much, but just the fact i now knew god really did exist is a very big thing. This wasn’t like any dream , it was real. 12-22-12 It’s really difficult to explain how i felt after this. Seeing this door affected me so much. It was like this power of this Vision became part of me. I could feel someting almost electric inside me. I knew it would take time to understand it, but my faith was affected immediately. Now i knew God was real and it was up to me if i was worthy to be a helper or not. I began praying again thanking the creator for the great blessing i was given. I felt so humbled by even just the short presence of this great miracle. As the sun came up and the day started i began to feel thirst. The inipi the day before had been very hot. I felt my body start to desire water. But the miracle of the pink door and the voice i heard was inside me now. I offered this little suffering as thanks for the blessing i had received. I continued to pray , asking god to take pity on me, and give me whatever i needed to make me be a better person. Make me worthy to be a helper for the creator and mother earth. As the day went on it became hot and my thirst became greater. I knew i would be tested here. I had been instructed to watch even the smallest things, like insects and birds and animals. Later that afternoon the clouds started to come. They offered relief from the heat. Soon it began to rain, it was such a blessing to catch these raindrops in my mouth, like a gift from the creator. But it began to pour rain. I had a star quilt, and a buffalo robe to protect me. But before long they were soaked. I began to get very cold , i was soaking wet. I continued to pray thanking the creator for the blessing i received, and asking to please accept my suffering now as wopila, or thanks. It continued raining for hours, now it was getting dark ,and i was so cold, At this elevation , about 6000 ft. it can get very cold at night. As it got dark i remember i could not even see my hand, it was pitch black . I had great faith now that everything was for a reason. I remember i was so cold my teeth were chattering so much. I think it was just my bodies way of fighting hypothermia. My whole body was shivering. As the night went on every minute seemed like an hour. There was no way to relax in this kind of suffering, now it was up to god if i live or die. Before the sun came up it began to snow just a very wet snow. Now i couldn’t really think of anything except the pain my body felt. It was tempting to just get up and leave. In 30 minutes i could be at my land and get warm. I think it was the blessing of the vision i received that kept me there that day. My buffalo robe was so wet it was of no use. It continued to rain all day. Later my shivering was starting to be less, i think my body had used up its energy to try to survive. I remember going in and out of sleep. Now i was so weak i don’t think i could have left even if i wanted to. It continued to rain. I was unconscious when my helper came in the early evening. I was able to wake up and with their help i stumbled down to the camp. They had tried to start a fire for the inipi, but all the wood was so wet from the rain. Together we finally managed to get a fire by using small kindling. After an hour or so the rocks were fairly hot, and we had the ceremony, i told of the vision i was blessed with. Then we finished. 12-24-12 I took a couple of days to try to recover a little. Of course i thought alot about what had happened to me, i knew i had received something special when i was there. It was almost too much for my mind to really comprehend. I kind of felt afraid to go out in a public place, like others would see i was different. I decided i would make some prayer flags and take them to the place where the sacred pipe is kept, in Green Grass SD. I wanted to offer them in thanks for the vision i had received. It was about a 200 mile trip, at that time i rode a motorcycle sometimes. So i decided to ride it there. I arrived in Green Grass and pulled up to the house there . Earlier that winter i had met Stanley and Cecelia Looking Horse for the first time. Stanley and his wife Cecelia spoke just a little English, but they seemed very kind to me. As I pulled up on my motorcycle I saw some activity near the inipi. I got off and walked over to it and met Silas High Elk and his son Arlee, Stanley was there too. I was told they were about to have a ceremony for a man that was on the hill for hanblecheya. He would be coming down soon and they invited me to come into the inipi with them. I was happy to accept their invitation. 04-11-13 After the rocks were ready they went and got the man and brought him down to the inipi, He was an older man in his 50s. I could tell he suffered a great amount and i felt compassion for him, because i had gone through the same thing a few days earlier. We sang the pipe songs and prayed , then we went into the inipi. I sat next to Stanley, he was pouring the water. Really i just remember it was very hot, and the prayers were very long. They all spoke lakota and i only could understand a little. These men were all very sincere in their prayers. When it was my turn to pray , i told what hapened to me a few days earlier in my own vision quest. Arlee was the translator for me. I know they had heard the visions of many men and women before, but they were very kind to me , and encouraged me to tell about it. After i was finished and Stanley had finished his prayer, we opened the door and we smoked the pipe. I felt so good to be here with these men at this time. Their faith was very strong, and i could feel it. After smoking the pipe Stanley spoke to the man that had just finished his hanblecheya, he spoke a long time in Lakota. When he was done speaking to him, he also spoke to me about what had just happened to me in my vision quest, Arlee was able to tell me what he said in english. It was very powerful for me. I felt like i had been guided to this place to be with them on that day. 6-27-13 After the inipi ceremony, Stanley invited me to spend the night. We spent the night and the next day getting to know each other more. I got a very special feeling when i was with him, like he had wisdom and knew things about life. Later Stanley told me about his plans to start something called traditional days. His idea was to get people that still know about traditional way of life to come together and help to teach their knowledge to the people that were forgetting these thing. I was very suprised and happy when i heard him say this, now i really felt like i had been guided here for a reason. I promised to return in two weeks and help any way i could. 6-28-13 I returned to Green Grass two weeks later. Stanley had asked me to come a couple days early to help prepare things. I was very enthusiastic and anxious to help him . This was really my dream i had earlier that winter. We worked hard prepareing the arbor and getting firewood etc. This was really the first time I stayed very long in Green Grass. It was nice to meet the people there and start to understand their way of life. I learned it was hard in many ways, most of the people lived without running water , or indoor toilets. But i felt like they had something many people dont have. To me it seemed like going back in time. A time when people lived simple but also cared about each other. During the next week Stanley had asked people to come and teach or demonstrate different things they know. Each day was different, there were people that came and taught crafts like beadwork , and quillwork. Also we did try a little hide tanning, but some days some men would just gather around a drum and sing traditional songs. Also there were elders that came and talked about traditional life and how things had changed. Not just the physical way we live now compared to long ago, but also the way people were changeing in the way we think and relate to our mother earth and each other. I was just happy to be there and listen and try to learn. The next weekend Stanley said there would be a nameing ceremony, A woman named Ann Medicine had asked Stanley to give her two daughters names. She had come from California to do this. She was the assistant dean at Stanford University. The day came and after a inipi ceremony the nameing ceremony began. Shortly after he started Stanley asked me to come to the center and stand beside him. I really did not know why, Then he told me he was going to give me a name. I was shocked. The ceremony took awhile and there were certain songs that had to be sung and a special prayer. After this was done he gave Ann’s daughters their names, and tied a medicine wheel with a feather to their hair. Then he did the same to me and said my name is ZintKala Zi, or Yellow Bird. I really didn’t know what to say. I just accepted it, and promised a wopila, which is a special dinner given to show thanks for a blessing. 6-30-13 I returned back to my land energized from spending time in Green Grass. Now i had to get ready to go to California to spend time at the Hog Farm. They had land about 170 miles north of SanFrancisco. I have to tell you after spending many weeks not working i was kind of pitiful, i really didn’t have the money to do this. I was getting a railroad unemployment check , which at that time was 125.00 a week. Not very much really. I just felt like i had to do this. Earlier that winter when i prayed with flags , i prayed that Tunkashila would take pity on me and help me by sending people that could help me learn the things i needed to know. I had a strong feeling when i met Jahanara and her friends a few days later that they were sent to me. Soon i would find out i was right. 7-5-13 I arrived in Berkely and was greeted by Jahanara. I really didn’t know who these people were before I met Jahanara, But later i started to learn more about them. I learned Wavy was one of the MC’s at Woodstock. The hog farm was there and became kind of an important part of keeping the peace there, and helping to organise a free kitchen. I really tried not to have preconceptions about them, I knew i was brought here for a reason. I just had to keep an open mind and be open to learning whatever i was supposed to learn there. Jahanara warned me a little that the hog farm people don’t accept people easily, And that i should try to make myself known as a person that works hard without complaints. So i had every intention of doing that. The next day i arrived at their land near Laytonville, they were in the process of making the camp for kids, that they called Camp Winnarainbow. They had 6 Tipis they had sewn up and made, Also i brought my own, because Jahanara had asked me to. They were just in the process of cutting tipi poles , Which if i remember correctly was well over a hundred poles. I joined in with the crew doing that. Each one had to be peeled, and then we used a rasp to remove sharp edges, and we even sanded them. There were many other people doing other jobs, They needed to build an outdoor kitchen, a stage for perfomances, a water system, electrical work. I kind of watched as they decided who would do what jobs. It seemed like there was always someone that had the abilitys to do different things. 7-6-13 The days were long, we worked very hard everyday. I started to feel like i was part of this family or group called the Hog Farm. Eventually most of the work was finished and it was time for the camp to start. I think there were about 50 or 60 kids scheduled to arrived There were kids from friends of the hog farm, and some of the hog farm kids would take part in this too. There were also some inner city kids that were given the opportunity to be there. Wavy had some people from a circus there as counselors, and also teach certain circus or acrobatic type things. I guess you could say Wavy was the head clown or performer there, but really he was much more. He had a way of making everyone laugh everyday, but he also had a spiritual side to him that came out just through kindness and love. I remember one morning Wavy showed up at breakfast wearing a paper bag over his head. It got a few smiles, but no one really said anything, because we were all living in this world Wavy created. A world where there was logic in illogic, and order in disorder. It was a sense of freedom different than the real world. I shared my tipi with Wavy and some of the hog farm kids. Now looking back i wish i could be there again. For those of you that would like to know a little more about Wavy, i recommend you see the movie, ( SAINT MISBEHAVIN) The Wavy Gravy movie. It will break the preconceptions you might be having now. 8-29-13 After the main work at the camp was finished, and the activities were going on each day, I started to spend more time with the regular hog farm members at the farm house. Each day they designated jobs for everyone and I tried to join in and help as much as I could. By this time I was getting a real feel for the feeling of working together. It was very powerful to be a part of this kind of life. These were mostly just normal types of things we did for the camp , and just daily chores. But i got a real sense of how much easier it might be to live like this and work together. I spent quite a bit of time getting to know a few of the older members, that wasn’t so easy at first. They were a little skeptical of new people showing up, I’m sure over the years many people came and tried to take advantage of their hospitality. I think I had proved I was willing to work and have a good attitude, so I started to earn a little respect. There was a group planning a trip to Ventura California, Some of the Hog Farmers were friends with a band called The Grateful Dead. The hog farm went to some of their shows to help with a kind of in between security for the band, among other things. The Grateful Dead liked the hog farm to try to keep the police from getting involved if possible. Also sometimes Wavy did the MC duties for them. I was asked if I would like to go on the trip. I was told this was work, and not a trip for fun. I accepted the invitation. My time there was getting short and after we returned i would have to leave. I had promised Stanley Looking Horse I would come to the Green Grass Sundance in early August to help . We arrived in Ventura, it was quite a scene , I believe there were at least 5,000 people camped there with many more expected for each of the 3 days of shows. We had an old Greyhound bus and we also used tents outside the bus to make camp. As the shows started i began to get a sense of the kinds of issues that came up. It was everything from crowd control for a large group that didn’t have tickets, so they wanted to tear down the fence. To minor injuries that we tried to take care of, There were also people taking drugs that took too many and just needed someone to take them to a quiet place and help them get through it. Mostly it was LSD. I tried to put aside my preconceptions and just help however I could, no matter how unusual it seemed at first. I remember at first thinking I’m really not like these people at all, but after spending a long time with one person that came in like this, I started to learn it was about trying to feel what he was feeling. When panic started you reflect a calmness. Sometimes he would be silent and in his own world, and nothing needed to be said. Sometimes he just needed to be touched or hugged, or sometimes he just needed to be left alone. It was kind of like playing an instrument. Certain notes evoked certain emotions. By the end of the three days I felt like really these were just people and no different than anyone. Some were good, maybe some not so much. It wasn’t up to me to judge them. I know i did learn something about myself during the three days there. I learned to try not to have preconceptions, If the mind is open, knowledge and teachings can come from places you never expected. I learned about a different way to communicate, by just sensing someones feelings. 9-18-13 After the concert we retuned to Berkeley. It was hard for me to think about leaving, the Hog Farm seemed like a family to me. I had been living in isolation all winter, and being part of a family felt so good. One of the elders named Evan Engber, did talk to me about staying., but i had to decline. I felt like it was such a privilege just to be asked, even at that time they did not accept new people very easily. Before I left they gave me some gas money, and Calico asked me if I could work at a show in Red Rocks in early September. The Grateful Dead would be playing there for 3 days. I agreed to meet them there, and it made me feel better knowing I would be with some of them soon. The next day I went to Laytonville and packed my tipi, A couple of the members helped replace a starter on my old 57 ford that I drove, I said my goodbyes, and I was on the road back to South Dakota. I had so many things to think about while I drove. The miracle of seeing the pink door in my vision was still so strong in my mind. I felt like i was being guided everyday now . My whole outlook about life had changed. Now i listened for the voice inside me to guide me, and had a strong belief in it. I thought about what i had learned at the Hog Farm. I really don’t think I was guided there to learn from the camp for kids, it had more to do with understanding the feeling and power of people accepting each other as family. All familys have disagreements and nothing is perfect in life, But if you really have love for each other, and are dedicated to each other, it’s a very powerful thing. Also I thought about meeting Stanley and the other people in Green Grass, there was a simialar kind of feeling there. Soon I would be at the Sundance, I knew it would be a very powerful experience that required a great deal of respect. After i got home I put up my tipi on my land, it was beautiful and peaceful there. I spent a couple days just trying to relax before i went to Green grass. My father was anxious to help me work on the small cabin I had started. I also had it in my mind to finish it, but these spiritual things I was doing seemed more important to me now. I was used to living in the tipi, so not having a cabin didn’t really worry me. I think it did worry my parents though. I left for Green Grass after my short rest. I arrived on Thursday , the Sundance had already started. I went to the small house Stanley and Cecielia lived in. When I entered, I saw Stanley and Cecelia and immediately i felt like something was wrong. It looked like they had been crying. I found out that Arvol their son and the designated keeper of the sacred pipe had been in a horse accident. He was in the hospital in Rapid City. They were not sure if he would recover , the doctors did not think so. Stanley asked us all to pray for him. The Sundance went on , I think it gave everyone there more reason to humble themselves and sacrifice their bodys to ask for the Great Spirits help. I was only a helper there doing the small things i could, but I tried to keep Arvol in my thoughts always and prayed for him to recover. The Sundance was over on Sunday, before i left Stanley said that a miracle happened, his son Arvol would be OK. The doctors were all suprised and could not believe it. Many years later Arvol told me a story about how spirits came to visit him in his dreams there in the hospital. They said he needed to help his people and all people living on the Sacred Mother Earth. I think the prayers of everyone at the Sundance were answered. Before I left Stanley asked me if I could return soon to help them get firewood before winter comes, so I agreed to return in a couple of weeks with my truck and a chainsaw. 9-20-13 I returned to Green Grass a few weeks later to help get firewood, it was hard work. I remember we got over 20 pickup loads in the week I was there. I got to spend some good time with Stanley and Cecelia, and became much closer to them. I left Green Grass and had to get ready to go to Colorado. I had just enough time to get home get on my motorcycle and head to Red Rocks to meet the Hog Farm bus. Red Rocks had a parking lot a few miles away from the actual concert location. It was a big lot , maybe 20 acres. It had a 6 or 7 foot chain link fence around it, not really the nicest place for a campground, but it was the best option I guess. It was going to be the campground during the 3 days of the concert. I met the Hog Farm bus and we went to the parking lot campground. We set up camp and soon it started to fill up. The first night, Friday night, I got to go to the show and help. Red Rocks is a very special place, A natural ampitheater In the rocks. I just remember it was a very special show that night. Sometimes the Grateful Dead had a certain kind of energy that happened, and that was one of those nights. I think the show ended about 11PM. so we were back about midnight. The next afternoon I was asked if I would stay at camp and help there so I agreed. everone was off to the show by 5 or 6 PM. Shortly after they left, the Red Rocks security brought a man that had obviously taken too much of something. We brought him into our camp and sat him down. He was saying something over and over. He said God is truth, God is truth, God is truth, He would say this over and over. Then he would change the words and say Truth is God , Truth is God, Truth is God. It was like a stuck record, he never stopped, he really would not or could not hear anything I said, So i just stayed with him. Later the other people came back. It was now after midnight, Sometimes he would say this very loud almost shouting. Truth is God, God is Truth, over and over. At one point maybe 3 or 4 in the morning, he wanted to walk, All the other hog farm people wanted to sleep and he was so loud he was keeping everyone awake, so we took off wandering through the camp. We were tripping over tent lines and people in sleeping bags. He had his arms stretched out like Frankenstein All the time he was saying God is Truth , Truth is God over and over. I tried to steer him around tents and people that were sleeping on the ground. At one point we got close to the big tent that had a very large loud diesel generator. He walked toward it, I tried to hold him back , but he was obsessed with trying to get close to it. He got close enough to it to reach out and touch it, he burned his hand a little and turned around and went the other way. After that we walked toward the fence on the East side of the camp, when we reached it he tried to climb over the fence , but I pulled him back. The sun was just starting to come up. He seemed like he had found this spot now and just wanted to stand there and say his mantra over and over. I stayed with him for an hour or two. He didn’t move he was just repeating the God is Truth words over and over. I was getting tired after being awake all night. We all took turns keeping an eye on him during the day. He was about 100 yards away from our camp, so we just made sure he didn’t try to go over the fence, and sometimes we would go try to communicate with him , but he didn’t seem to hear anything. He kept repeating these words all day, until it was almost time for the show to start Sunday evening. We talked about it and decided we would have to call the ambulance to come get him. Wavy and I went to him and Wavy started yelling at him in his ear. He said stop it,! He started saying if you don’t stop you will have to go to the mental institution! There’s an ambulance coming to get you! All of a sudden he stopped. He turned around and looked at us and it was over. We asked him if he was thirsty or hungry and he said yes. We started to walk back to camp just as the ambulance pulled into the parking lot. We gave him some food and water, and hid him from the EMT’s. We gave them some story and they left without him. 9-28-13 The next morning I got on my motorcycle to start home. The words that guy was saying were in my mind, Truth is God, God is Truth. I had listened to him say it for almost 24 hours. I planned to stop at my friends house in Sterling , Colorado. He was the friend that came to help me before my vision quest. He was in the sweatlodge when the four red medicine wheels had burnt up in the rocks. As I said before he really didn’t know that much about these things, he was just a friend that wanted to help me. I got to Dan’s home in Sterling, which is about 120 miles northeast of Denver. We spent some time talking , and then Dan went to get some photos he had taken while he visited me . 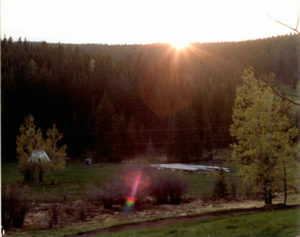 We were looking at them and i got to this photo of my land with the sunset and the tipi in the background. I saw something red in the photo, I looked closer, and it was a red medicine wheel. It was like an electric shock went through my body. At first I couldn’t believe what I was seeing. I looked at it more and I saw the pink light coming out of the center, with a rainbow at the end of it. Dan hadn’t really noticed it before. I said Oh My God, I can’t believe this. Then it hit me that this had to be the same day those quilled red medicine wheels had burnt up in the sweatlodge. I remember Dan asking me to use his camera to take some photos at the end of that day, and he left the next morning.These were the photos I had taken . I also started to think about the vision I had of the pink door to the spirit world. It was about the same color as the light coming out of the center of the medicine wheel. Also Kenneth Youngbears Medicine way was to attach the red medicine wheel, then the pink conch shell, then the small pouch with little bits of earth inside it to my pipe and offering pipe. It was really too much to comprehend all at once. Dan gave me the photo and the negative and I left on my motorcycle to start home. As I was going down the road I remember tears streaming down my face as I prayed for understanding about this thing. I knew it was some kind of miracle. Also I still had those words in my brain, God is Truth, Truth is God. Sometimes I had to pull off the road and look at the photo again. I felt like I was blessed with this for a reason , but I wasn’t sure why. I know i could feel myself change. I think I had faith before, but this changed everything for me. 9-30-13 After I got home I think I looked at the photo for hours and hours. There were even some other things in the photo I thought I could see. There is a shadow underneath the sunset. If you look at the top part of the shadow, it looks like the image of a face or faces in the trees. I thought about this miracle photo so much, I asked myelf why did this happen? What does it mean? I remembered my powerful dream I had sleeping in theTipi the winter before. I was told to use my land to start a learning center, to help teach things that have been forgotten. I also remembered that after that dream I had doubts if I was really supposed to do that. So i prayed for some kind of sign that would tell me it was real. Could that be why this happened? Then I felt kind of bad, maybe my faith was so weak I needed this miracle. I was blessed with my vision of the pink door, but after time maybe I would rationalize it just came from my own mind. I don’t think I could do that with this photo. I decided I needed to get some copys made and send one to Stanley and Cecelia. I wasn’t able to go see them right away, so I would mail a copy to them. I knew it would take time to understand this thing that happened. Maybe I never would. 10-9-13 At the very beginning of my writing, I said I would tell a story about a blessing I recieved. It was in 1985, in 1984 i went to Greengrass for my Vision Quest. I went across the river near Stanley’s home, It was a very powerful experience for me. I stayed 3 days and 3 nights there. The next year I wanted to find another place near my land to Hanbleceya. I found a place not too far from the hill I had my vision of the Pink Door in 1983. This new place I found was about 1,000 feet higher. It was very special, the elevation was so high only very short trees grew there. Mostly it was loose rocks, except for one place, It had a patch of bear berry leaves, also known as Kinniknnick. It was about an 8 by 8 foot area facing to the west on the hill. This place was not easy to get to, there was no trail, and it was very steep sometimes. I decided this was the place. I knew it would be a very difficult place to Hanbleceya. The storms and the wind would be very strong, maybe I would die here. I would leave that to the Great Spirit, if it was my time to die, I wasn’t afraid. I wanted to sacrifice myself to become closer to Tunkashila. The time came in June when the Chokecherrys started to bloom, I went to Greengrass and got Stanley, he had agreed to help me. We arrived at my land, and I was prepared to go up the next day, but shortly after we got there it began pouring rain. I had finished my 10ft. by 12ft. log house. It had a bed, a wood cookstove, and a small table and shelves. I had been living in it about a year. Stanley stayed in the cabin, and his helper Melvin and I stayed in the tipi. It rained hard for 3 days so we waited. Finally it seemed to stop, I got my prayer flags finished, and took the chokecherry trees and sage up to the hill,and made my alter I would sit in. I had to use a steel spike and hammer to make holes for the chokecherry trees. The ground was mostly rock. This hill was about 3 miles from my land. After the inipi ceremony we all got in my truck and drove to a place closer to the hill. It was still very hard to get up there. Stanley sang the hanbleceya songs and closed my alter with the tobacco ties I had made. Now I was alone. I had thought of many prayers i wanted to say, soon I could see the lightning to the west, a storm was coming. I kept praying . Then the winds came, very strong, maybe 50 or 60 mph, then the rain started, and the lightning was all around me. The thunder was like dynamite going off. I started to pray just to live. It stayed like this off and on for the 3 days and 3 nights I was there. I felt like the wind and rain ,and hail was beating me to death. lightning struck very close to me at least a dozen times. I was just hiding in my buffalo robe with my pipe, praying that I would live. This was much more intense than anything I had ever experienced before. After it was over I walked back to my land. I didn’t have shoes and the sharp rocks cut my feet, but i didn’t even notice. My body was numb. Before Stanley had left me there , he told me he could not come to get me because it was so hard to get up the hill. I just nodded to say I understood. When I arrived at my land the fire was going for the Inipi. We had the ceremony and finished, I didn’t have a vision , but I knew something powerful had happened to me. It was a couple days later I was driving to town, and I saw a dead bird alongside the road, There was another bird standing near it. Then it hit me that the bird that was next to it was the dead birds mate. I began to cry so hard, I had to pull over and I cried and cried. I could feel the pain of the bird that had lost it’s mate. Then I realized something changed me on that hill . Later in the sweatlodge Stanley told me I was given a great blessing, it was compassion. The ability to feel the pain of others, even feel the pain of animals, and birds. He said I would have this blessing the rest of my life.